This is my second attempt to paint night. This one however, is in the city. 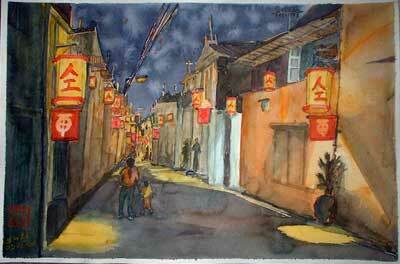 This is a familiar Chinatown scene, with yellow and red lanterns and buntings. I think everywhere around the world, the familiar scene evokes memories of a stroll down Chinatown, especially near the Lunar New Year celebration period. It was such a joy to see the colours come alive. The white-green patch you see at top right is a small alleyway which is lit by fluorescent lamp - colour of the light reflected off the lime plaster cement wall.